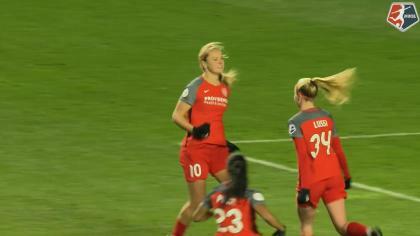 Portland Thorns FC topped Utah Royals FC 2-0 on Friday night in front of a crowd of 15,113 at Providence Park in Portland, Oregon. The win moved the Thorns into second place in the NWSL, one point ahead of Seattle Reign FC, who play Saturday night. With the win, the Thorns are now 4-3-3 (15 points). Thorns coach Mark Parsons became the third coach in NWSL history to reach 50 regular season wins, joining Reign coach Vlatko Andonovski and Utah coach Laura Harvey. Utah Royals FC fell to 2-2-5 (11 points) with their first road loss in franchise history. In the 18th minute, Christine Sinclair scored the first goal of the game for the Thorns, her league-leading sixth goal of the season. Sinclair started the play at midfield, serving a lob over the top to Tobin Heath, and then continuing her run towards goal. Heath threaded the pass back to Sinclair, who took a touch to her left before shooting and beating Utah goalkeeper Abby Smith. Lindsey Horan doubled the lead in the 39th minute, finishing a cross from Meghan Klingenberg with her knee to give Portland a 2-0 lead. The goal is Horan’s fourth of the season, pulling her into a tie for second in the NWSL. 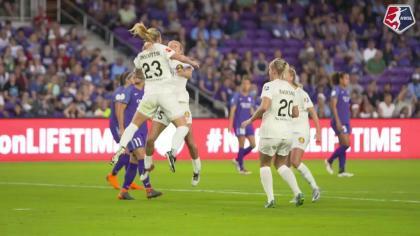 The Thorns had a great chance to score just a few moments earlier, but Smith made a kick save and then Utah defender Becky Sauerbrunn blocked a shot with her face. Not ?ne, but tw? close chances from inside the area. Utah had a chance to pull one back near the end of the first half, but Klingenberg cleared Amy Rodriguez‘s shot off the line. Sinclair and Heath nearly connected again for another goal late, but Sinclair’s shot bounced off the crossbar. It’s the second straight shutout for the Thorns. It’s also the second clean sheet for goalkeeper Britt Eckerstrom, who made two saves in the match, including one on a hard Rodriguez shot moments before the final whistle. Rodriguez played all 90 minutes for the first time this season, after returning from the ACL tear she suffered last year. The Thorns will next be in action on Wednesday night when they host the unbeaten North Carolina Courage. Utah Royals FC will visit Sky Blue FC (0-6-1) on June 2. Match ends, Portland Thorns 2, Utah Royals 0. Second Half ends, Portland Thorns 2, Utah Royals 0. Attempt saved. Amy Rodriguez (Utah Royals) right footed shot from outside the box is saved in the centre of the goal. Attempt missed. Amy Rodriguez (Utah Royals) right footed shot from the centre of the box is close, but misses to the right. Assisted by Gunnhildur Yrsa Jonsdottir with a cross. Corner, Portland Thorns. Conceded by Abby Smith. Attempt saved. Christine Sinclair (Portland Thorns) right footed shot from outside the box is saved in the top centre of the goal. Assisted by Tobin Heath. Ifeoma Onumonu (Portland Thorns) wins a free kick on the left wing. Substitution, Portland Thorns. Ifeoma Onumonu replaces Ana Maria Crnogorcevic. Foul by Angela Salem (Portland Thorns). Offside, Utah Royals. Katrina-Lee Gorry tries a through ball, but Gunnhildur Yrsa Jonsdottir is caught offside. Angela Salem (Portland Thorns) wins a free kick in the defensive half. Offside, Portland Thorns. Angela Salem tries a through ball, but Ana Maria Crnogorcevic is caught offside. Attempt blocked. Katrina-Lee Gorry (Utah Royals) right footed shot from outside the box is blocked. 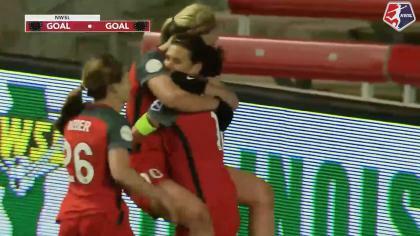 Assisted by Amy Rodriguez. Attempt saved. Ana Maria Crnogorcevic (Portland Thorns) header from the centre of the box is saved in the centre of the goal. Assisted by Tobin Heath with a cross. Rachel Corsie (Utah Royals) is shown the yellow card. Lindsey Horan (Portland Thorns) is shown the yellow card. Corner, Utah Royals. Conceded by Kelli Hubly. Substitution, Portland Thorns. Kelli Hubly replaces Ellie Carpenter. Substitution, Utah Royals. Elise Thorsnes replaces Erika Tymrak. Substitution, Portland Thorns. Angela Salem replaces Andressinha. Erika Tymrak (Utah Royals) wins a free kick on the left wing. Delay in match Ana Maria Crnogorcevic (Portland Thorns) because of an injury. Delay in match Becky Sauerbrunn (Utah Royals) because of an injury. Attempt blocked. Ana Maria Crnogorcevic (Portland Thorns) left footed shot from the centre of the box is blocked. Assisted by Christine Sinclair with a through ball. Second Half begins Portland Thorns 2, Utah Royals 0. First Half ends, Portland Thorns 2, Utah Royals 0. Attempt missed. Desiree Scott (Utah Royals) right footed shot from outside the box is high and wide to the right following a set piece situation. Attempt blocked. Amy Rodriguez (Utah Royals) left footed shot from the centre of the box is blocked. Attempt blocked. Erika Tymrak (Utah Royals) right footed shot from the centre of the box is blocked. Goal! Portland Thorns 2, Utah Royals 0. Lindsey Horan (Portland Thorns) right footed shot from very close range to the centre of the goal. Assisted by Meghan Klingenberg with a cross. Attempt blocked. Lindsey Horan (Portland Thorns) left footed shot from the centre of the box is blocked. Attempt saved. Christine Sinclair (Portland Thorns) right footed shot from the centre of the box is saved in the centre of the goal. Assisted by Ana Maria Crnogorcevic. Offside, Utah Royals. Amy Rodriguez tries a through ball, but Erika Tymrak is caught offside. Attempt missed. Brooke Elby (Utah Royals) right footed shot from the right side of the box is too high. Assisted by Diana Matheson. Attempt saved. Erika Tymrak (Utah Royals) right footed shot from outside the box is saved in the top centre of the goal. Offside, Utah Royals. Erika Tymrak tries a through ball, but Gunnhildur Yrsa Jonsdottir is caught offside. Goal! Portland Thorns 1, Utah Royals 0. Christine Sinclair (Portland Thorns) left footed shot from the centre of the box to the bottom left corner. Assisted by Tobin Heath. Meghan Klingenberg (Portland Thorns) wins a free kick in the attacking half. Offside, Utah Royals. Amy Rodriguez tries a through ball, but Gunnhildur Yrsa Jonsdottir is caught offside. Amy Rodriguez (Utah Royals) wins a free kick on the left wing.